As a country that is also a continent, Australia is home to its share of fantastic waterfront views. Despite being one of the largest countries on Earth, most Australians live along the edge of the coast, clinging to the few green areas in an otherwise inhospitable climate. What this means is there are many opportunities available to check out those brilliant coastlines on almost any visit to Australia because regardless of where you end up, you’re bound to be on the coast! Here are just a few of my favourite coastal locations! It’s hard not to love the Great Ocean Road long and winding drive along the southern Australian coast as it really is a route deserving of its name. With the various rock formations and cliff sides that are in a constant state of change thanks to the power of the tides, the Great Ocean Road is one of those coasts everyone should see once in their lives. Located within the Sunshine Coast just north of Brisbane, Noosa is one of many great destinations for surfers and beach goers looking to enjoy the perks of Australian living. With hiking trails and great facilities for cottagers and shoppers alike, Noosa is a great mix of natural beauty and commercialism. You can easily spend a few days just wandering around the laid back town, or using it as a jumping off point for seeing the rest of the Sunshine Coast! Known by many as the gateway to the Great Barrier Reef, the coast of Cairns isn’t so much a beauty to look at or swim in as it is for what it connects you to. Particularly in reference to the swimming side of things, salt water crocodiles ensure you do not swim in the city, but instead marvel at it from the adjacent pool. With this in mind, Cairns is a great sight for anyone heading out in a catamaran to dive one of the wonders of the natural world. 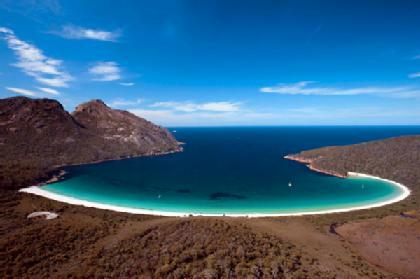 Maybe the most under visited location of all Australia’s coasts, Wineglass Bay in Freycinet National Park is worth the trip down to Tasmania to take in the perfect coastline framed by jungle and walking trails. Be sure you allow for a few hours here to truly take it in! Known as the eastern most point of the Australian mainland, Byron Bay is a rugged and picturesque locale that you will be sure to fall in love with. Whether it’s the strong winds blowing the warm air up the coast, the lighthouse perched at the very top or the overall feeling you get from this relaxed place, Byron Bay is always high atop everyone’s list!